Not far below the dream of owning a real lightsaber is the fantasy of every earthbound Jedi—owning one’s very own R2-D2. And if that droid can roll around and bring beer on command, all the better. Appliance maker Haier Asia took a big step in bringing that dream to life in Japan on Tuesday, launching a mobile fridge that looks just like the iconic Star Wars robot. The R2-D2 fridge will feature the same dimensions, sounds and flashing lights as the original film robot. In one scenario suggested by the company, the remote-controlled bot can roll into a user’s living room and deliver drinks for guests—just like on Jabba’s sail barge. At an event in Tokyo, Haier Asia CEO Yoshiaki Ito summoned the droid on stage, opened the fridge door on its front panel and grabbed a cool drink. He also announced a series of covers for standard refrigerators featuring other characters from the Star Wars series such as C-3PO, Darth Vader and stormtroopers as well as posters from the film series. The company also showed off fridge covers based on Marvel characters such as Iron Man. The R2-D2 fridge isn’t the first life-sized replica of the robot—fans such as the R2-D2 Builders Club have made them for years—nor the first robot that can transport drinks across a room. But it could well be the first to be a mass-produced mobile cooler. 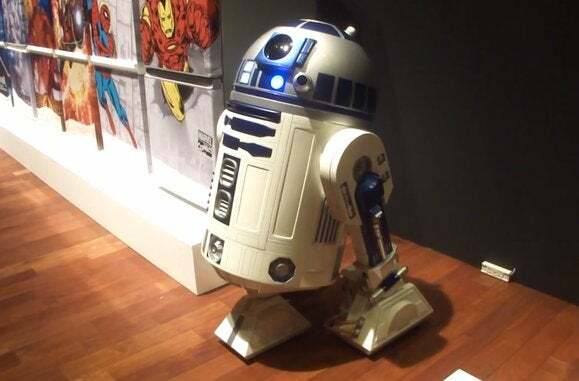 Based on a licensing agreement with Walt Disney Japan, the chilled-out R2 unit is slated to go on sale next year. The company did not disclose the price, and officials at Haier Asia could not be reached for comment.